Pivot Tables allow you to calculate and analyze data in several different ways. Number of Units Sold and Total Sales are summarized by the Sum Function. Unit Price uses the Average Function. Furthermore, Pivot Tables also allow you to display values based on other items or cells. You can, for example, display values as percentages or running totals. These 2 options allow you to deal with a wide variety of situations and data analysis requirements. However, in certain cases, you may want to create your own formulas. In this Pivot Table Tutorial, I focus on Calculated Fields. I provide all the information you need to quickly carry out the most common and relevant operations with Calculated Fields. All the matters I explain in this blog post are illustrated with an easy-to-follow example. This Pivot Table Calculated Fields Tutorial is accompanied by an Excel workbook containing the data and Pivot Table I use in the examples below. You can get immediate free access to this example workbook by subscribing to the Power Spreadsheets Newsletter. The following Table of Contents lists the topics I cover below. First column: Date. Period covered is from January 1 to December 31 of 2017. Fifth column: Unit price. The unit price of an item (for example, the Surface Pro 4) doesn't change. In other words, every item has a single unit price regardless of (i) store location and (ii) date of sale. Using this source data, I create the following Pivot Table. This is the Pivot Table we'll be working with throughout the rest of this Tutorial. Number (Sum) of Units Sold. Total Sales (Sum of Sales Amount). The data corresponding to each of these Fields appears in a separate column of the Pivot Table. Let's dive into the topic of Calculated Fields. I start by defining what a Calculated Field is and when can they help you. A new field created from other fields in the pivot table. You normally use Calculated Fields for purposes of adding a new Field within your Pivot Table. The newly added Field carries out certain calculations based, usually, on the values of other Fields. In more technical terms, Calculated Fields use the sum of the underlying data of the Field(s) the Calculated Field formula uses. In other words, when you work with Calculated Fields, you're working with all the underlying data (vs. specific Item(s)) of the relevant Field(s). Because of the above, Calculated Fields are useful when you want to use all the data from certain Field(s) in your formulas. Let's assume that you need to make a very basic calculation to estimate the Cost of Goods Sold for each store and item. Notice that the source data for the Pivot Table doesn't have a column with Cost of Goods Sold. In some situations, you may be able to go back to the source data and add such a column. However, in other cases, adding a new column to the source data may not be practicable or convenient. An alternative to adding a new column to the source data is to use a Calculated Field. Reduced risk of reference or calculation errors. Both advantages will become clearer as you read through the rest of this Pivot Table Tutorial. This doesn't mean that Calculated Fields are suitable for any situation. Further below, I introduce several common problems and limitations of Calculated Fields. That introduction should help you to determine the cases in which Calculated Fields may not be the best alternative. Uses the values from other Field (Total Sales). Carries out certain calculations (multiply Total Sales by a percentage). Once I add the Calculated Field to the sample Pivot Table above, the Excel worksheet looks as follows. Notice the new column (Cost of Goods Sold). Don’t confuse Calculated Fields with Calculated Items. Even though they share some similarities, these terms refer to different constructs. The main difference is the fact that Calculated Items work with individual records. In other words, Calculated Items allow you to work with Item(s) from within a Field. Calculated Fields, as I mention above, use all the underlying data of the Field(s) the Calculated Field formula uses. Use Calculated Fields when you want to work with all the underlying data of certain Field(s). As I mention above, the rough equivalent to Calculated Fields is to add a column to your source data. Work with Calculated Items if your purpose is to work with specific Item(s) within a Field. Just as Calculated Fields are roughly equivalent to additional columns in the source data, you can think of Calculated Items as the rough equivalent to adding row(s) to your source data. Go to Ribbon > Analyze > Fields, Items & Sets > Calculated Field. Enter the name for the Calculated Field in the Name input box. Enter the formula for the Calculated Field in the Formula input box. The Values Area of the Pivot Table. The Pivot Table Fields task pane. Let's take look at each of these steps, and check out how to carry them out in practice. Select the Pivot Table report to which you want to add the Calculated Field to. You can do this by clicking anywhere on the Pivot Table. Once you've selected the Pivot Table, Excel displays two contextual Ribbon tabs: Analyze and Design. Go to the Analyze tab. Select Fields, Items & Sets > Calculated Field. As an alternative, you can use the keyboard shortcut “Alt, JT, J, F”. The first input box in the Insert Calculated Field dialog is Name. Excel automatically enters a basic name (Field1 in the example above). However, generally, it's better if you enter a more descriptive and useful name. For purposes of this example, I enter “Cost of Goods Sold”. As I explain above, one of the main purposes of Calculated Fields is to allow you to create your own formulas using data from other Fields within the same Pivot Table. The Formula input box is where you enter that formula you want to create. Notice that the syntax you use to specify a formula for a Calculated Field isn't the same that you use when working with worksheet formulas. This change may look scary at first. You shouldn't worry too much about this difference. In a section below, I provide a more detailed introduction to Calculated Field formula syntax and behavior. I also explain how you can easily insert a Field reference. Hint: you don't have to type the Field reference. This is helpful if you want to add more Calculated Fields. In such a case, repeat steps #4 through #6 as many times as necessary. Have finished adding multiple Calculated Fields. As I explain above, step #5 of the process to add a Calculated Field to a Pivot Table is specifying the formula you want to use. The formulas you use in Calculated Fields have a different syntax and behavior to regular worksheet formulas. The purpose of this section is to give you a basic overview of both topics. Certain Functions, subject to the main limitations I explain below. References to Fields. This includes both (i) Fields within the Pivot Table report and (ii) Fields that aren't currently displayed in the Pivot Table. Functions that require cell references or defined names. Examples of this type of function are the Lookups (LOOKUP, HLOOKUP and VLOOKUP) and INDEX. Functions that return variable results. Examples of this include RAND, RANDBETWEEN, NOW, and TODAY. References to Subtotals or Grand Totals of the Pivot Table. Functions, subject to the applicable restrictions I explain above. These are items #1, #2, #3 and #4 from the list of elements you can use to build Calculated Field formulas (above). In this section, I explain the basic rules you can apply to create references to data within the Pivot Table report (item #5 of the list). Let's start by recalling that Calculated Fields work with the sum of the underlying data for a Field. In other words, you use Calculated Fields when you want your formulas to work with the data from certain Field(s). ‘Sales Amount': Reference to a Field (Sales Amount) within the Pivot Table report. The Sales Amount for each Item (Product) and Store is added. In the example we're looking at, this value corresponds to that displayed in the Sum of Sales Amount. The sum obtained in step #1 above is multiplied by 65%. Notice that, as I mention above, I enter Items #2 (operator) and #3 (constant) as I would for a regular worksheet formula. You refer to a Field by using its Field Name. In the case above, this is “Sales Amount”. If a Field Name contains (i) more than 1 word, (ii) numbers, or (iii) symbols, wrap the name with single quotations (‘). In the example above, the name has 2 words (“Sales” and “Amount”). Therefore, I enter it within single quotes (‘Sales Amount'). In most cases, however, you don't even need to worry too much about the syntax for Field references. The Insert Calculated Field dialog box has a Fields list box that is quite helpful for these purposes. The Fields list box includes all the Fields that are available for you to use in your formula. Select Field you want to refer to within the Fields list box. Click the Insert Field button. In the sample image below, I select the Sales Amount Field. Alternative #2: Double-click on the Field you want to refer to within the Fields list box. Just as in alternative #1 above, I select the Sales Amount Field. In this Tutorial, I work with a sample Pivot Table that has only 1 Calculated Field (Cost of Goods Sold). Depending on the complexity of your Pivot Tables, you may have to deal with several Calculated Fields and Calculated Items at the same time. In such situations, it may be helpful if you can view all these elements at the same time. Go to Ribbon > Analyze > Fields, Items & Sets > List Formulas. Alternatively, use the keyboard shortcut “Alt, JT, J, L”. Each of these tables displays the Solve Order, (Field or Item) Name, and Formula for each Calculated Field or Item. From time to time, you may have to go back to your Pivot Table reports and edit previously entered Calculated Field formulas. Select relevant Calculated Field using the Name drop-down list. Edit the Calculated Field formula in the Formula input box. Click anywhere on the Pivot Table report you want to work with. Excel displays the Analyze and Design contextual tabs. Once Excel displays the contextual tabs, go to the Analyze tab. Select Fields, Items & Sets > Calculated Field. If you like using keyboard shortcuts, use “Alt, JT, J, F”. You modify a Calculated Field formula from within the Insert Calculated Field dialog box. This is the same dialog box that you use when you originally create the Calculated Field formula. Click on the drop-down arrow on the right side of the Name box within the Insert Calculated Field dialog box. Excel displays a drop-down list that includes all the Calculated Fields you've added to the Pivot Table report. From within this list, select the Calculated Field whose formula you want to amend. The sample Pivot Table that I use in this Tutorial has a single Calculated Field: Cost of Goods Sold. I select it. Once you've selected the Calculated Field you want to work with, Excel displays the current formula in the Formula box. You use that Formula input box to edit the Calculated Field formula. In this case, the Insert Calculated Field dialog box continues open. This is useful if you want to continue working with this dialog. For example, to modify other Calculated Fields, go back to step #4 as required. Clicking OK confirms all the changes and closes the Insert Calculated Field dialog. This option is suitable if you don't have to do anything else from within this dialog box. The basic difference between hiding and deleting a Calculated Field is that, if you delete a Calculated Field, Excel removes it permanently. That isn't the case when you just hide the Field. When hiding the Calculated Field, it continues to appear within the Pivot Table Fields task pane. The Pivot Table Field list. In fact, Calculated Fields can only be in the Values Area of the Pivot Table report. Appears at the end of the Pivot Table Fields task pane. Is added to the Pivot Table, as evidenced by the marked checkbox to its left. More precisely, the Calculated Field is added to the Values area. Alternative #1: Drag the Calculated Field and drop it outside the Pivot Table Areas. Alternative #2: Uncheck the box to the left of the Calculated Field in the Pivot Table Fields task pane. Right-click on a cell within the Calculated Field. Select the option to remove the Calculated Field. Go to Ribbon > Analyze > Fields, Items & Sets > Calculated Fields. Select the relevant Calculated Field using the Name drop-down list. Begin by selecting the Pivot Table you're working with. This results in Excel displaying the contextual Ribbon tabs (Analyze and Design). Go to the Analyze contextual Ribbon tab. Within that tab, select Fields, Items & Sets > Calculated Fields. You can replace the above by using the keyboard shortcut “Alt, JT, J, F”. After you complete step #2 above, Excel displays the Insert Calculated Field dialog box. The first box in the Insert Calculated Field dialog box is Name. Click on the drop-down arrow on its right. Excel displays a drop-down list with all the Calculated Fields within the Pivot Table report. Select the Calculated Field you want to delete. In the example I use throughout this Tutorial, the only Calculated Field is Cost of Goods Sold. I select it. Once you've selected the Calculated Field to delete, confirm by clicking the Delete button. You can repeat steps #4 and #5 above to delete as many Calculated Fields as you need. Once you're done, confirm everything by clicking the OK button. Calculated Fields can be very useful in some situations. There are, however, a few characteristics that limit their usefulness or cause problems in some situations. I introduce a few of these below. The restrictions regarding the elements you can use within your Calculated Field formulas. The fact that Calculated Fields can only be within the Values Area of the Pivot Table. Some limitations have certain workarounds that you can implement. This topic exceeds the scope of this blog post. I may write about it in the future. If you want to receive an email whenever I publish new content in Power Spreadsheets, please feel free to register for our Newsletter by entering your email address below. In the case of Calculated Fields, you can't use this option. Values of Calculated Fields are always summarized by calculating a Sum. Carries out the calculations required by your Calculated Field formula. If you right-click on a Calculated Field, Excel displays a contextual menu where the Summarize Values By feature is disabled. You can only use Calculated Fields or Calculated Items when you're working with Pivot Table reports that aren't based on an OLAP (Online Analytical Processing) database. Neither of these features is available if your Pivot Table report uses OLAP source data. The Data Model does not support traditional calculated fields or calculated items. When you're working with Pivot Tables, you have the option of displaying Subtotals and Grand Totals. If you're working with Calculated Fields, Excel also displays Subtotals or Grand Totals for them. 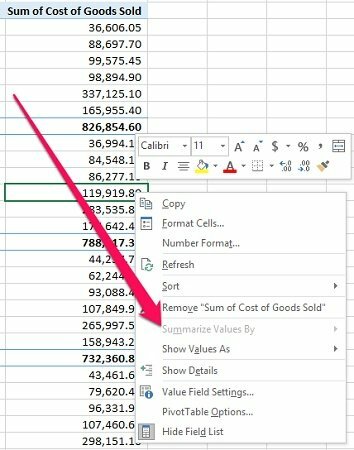 You may expect Excel to calculate those Subtotals or Grand Totals by adding up the values of the relevant Items in the Calculated Field. It takes the values of the Subtotals or Grand Totals for the Fields you refer to within the Calculated Field Formula. It carries out the actual operations required by the applicable Calculated Field formula. Adding the values within the Cost of Goods Sold Calculated Field. Multiplying the Total Sales Amount by 65%. This is the calculation that Excel carries out. If the Sales Amount is larger than $200,000, the Cost of Goods Sold is 55% of the Sales Amount. Otherwise, the Cost of Goods Sold is 65% of the Sales Amount. The Atlanta Total for Sales Amount is larger than $200,000. Because of #1 above, Excel calculates the Atlanta Total for Cost of Goods Sold as 55% of the Atlanta Total for Sales Amount. Due to the way Excel calculates the Atlanta Total for Cost of Goods Sold, the value displayed as Atlanta Total for Cost of Goods Sold ($699,646.20) isn't equal to the sum of the individual values within the Calculated Field ($749,457.6). The reason for this is that, for some of those products, the Sales Amount is below $200,000. Therefore, the Cost of Goods Sold is 65% of the Sales Amount (not 55%). When working with Calculated Fields in Pivot Tables, you'll constantly deal with the Insert Calculated Field dialog box. Generally, when you confirm changes by clicking the OK button of the Insert Calculated Field, Excel clears the Undo stack. Therefore, you can't undo previous actions by clicking the Undo button or using the “Ctrl + Z” keyboard shortcut. Due to their scalability, flexibility and ease of management, Calculated Fields are a great alternative for purposes of easily adding your own formulas and carrying out calculations within Pivot Tables. It's important you understand what goes on behind the scenes when you use pivot table calculations, and it's even more important to be aware of the boundaries and limitations of calculated fields and calculated items to avoid potential errors in your data analysis. How to insert a Calculated Field, and create appropriate Calculated Field formulas. See all Calculated Fields at once. Hide or delete Calculated Fields. This Pivot Table Calculated Fields Tutorial is accompanied by an Excel workbook containing the data and Pivot Table I use in the examples above. You can get immediate free access to this example workbook by subscribing to the Power Spreadsheets Newsletter. Click on any of the links below to purchase the book at Amazon now. PowerSpreadsheets.com is a participant in the Amazon Services LLC Associates Program, an affiliate advertising program designed to provide a means for sites to earn advertising fees by advertising and linking to Amazon.com. Excel 2016 In Depth . Excel 2016 Pivot Table Data Crunching .